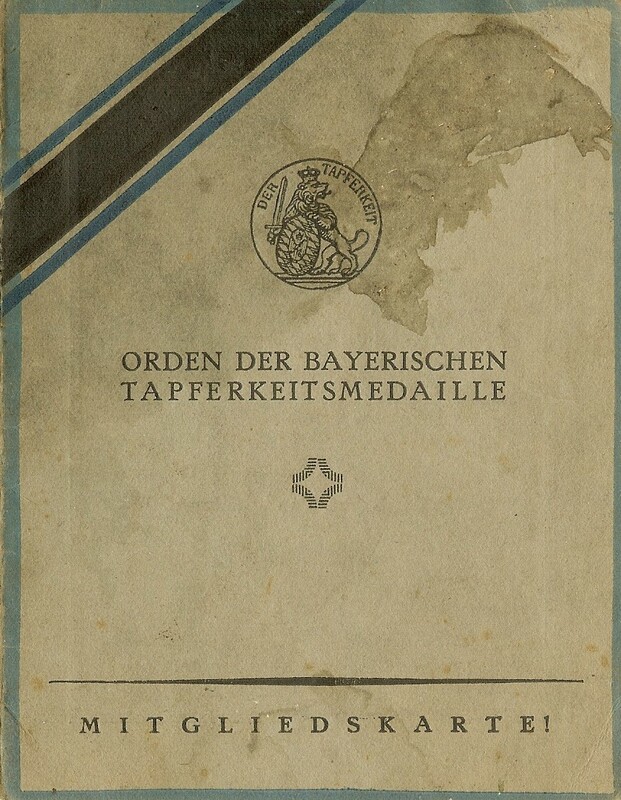 Figure 1: Front cover of the Orden der bayerischen Tapferkeitsmedaille membership booklet. Image from author’s archive. Figure 2: Inside of the membership booklet. Image from author’s archive. Figure 3: Close-up of Hermann Heimann wearing his lapel ribbons. Image from author’s archive. Figure 4: Reverse cover of the Orden der bayerischen Tapferkeitsmedaille membership booklet. Image from author’s archive. Vizef. d. Ldw. der 7. komp. b. Res.Inf.Rgts. 6. Im Frieden Kaufmann in Nürnberg. Geb. 21. 3. 1885 zu Oberdorf in Württemberg. Platoon Sergeant of the Landwehr of the 7th Company Bavarian Reserve Infantry Regiment 6. In peacetime a merchant in Nürnberg. Born March 21, 1885 at Oberdorf in Württemberg. Vizef. der Res. der 7. Komp. b. Res.Inf.Rgts. 6. Im Frieden Bahngehilfe in Nürnberg. Geb. 25. 10. 1885 zu Eichstätt in Mittelfranken. Platoon Sergeant of the Reserve of the 7th Company Bavarian Reserve Infantry Regiment 6. In peacetime a railroad assistant in Nürnberg. Born October 25, 1885 at Eichstätt in Mittelfranken. Figure 5: Obverse of an example of a Bavarian Bravery Medal in Silver of the type awarded to Hermann Heimann. Image from author’s archive. 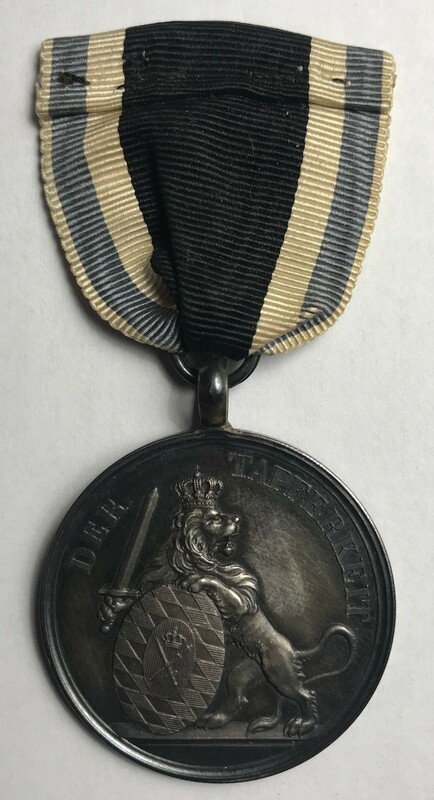 Figure 6: Reverse of an example of a Bavarian Bravery Medal in Silver of the type awarded to Hermann Heimann. Image from author’s archive. As listed in the book “Haben die Juden in Bayern ein Heimatrecht” (Do the Jews in Bavaria have Rights of Citizenship?) 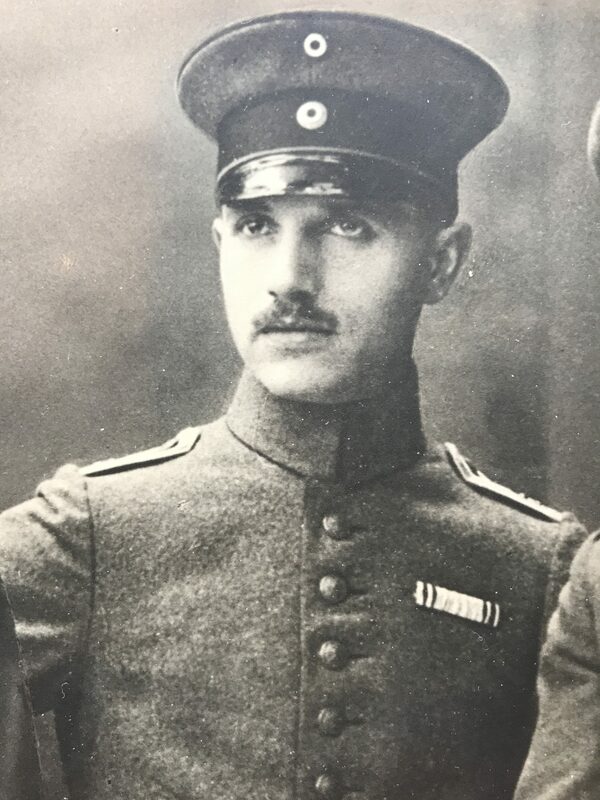 published in 1928, Hermann Heimann was one of the thirteen (13) Jewish recipients of the Bavarian Bravery Medal during the World War (1914-1918). There were two (2) Gold Medal recipients and eleven (11) Silver Medal recipients. 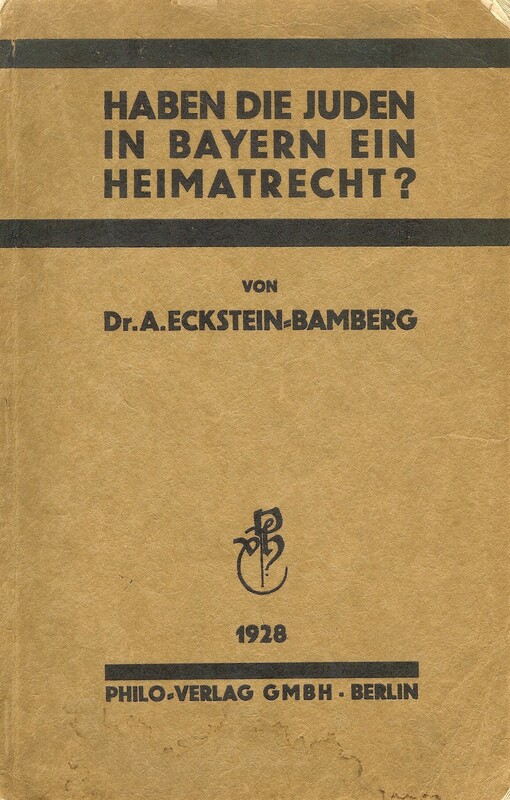 Figure 7: Cover of publication “Haben die Juden in Bayern ein Heimatrecht?” summarizing the wartime deeds and awards of Jewish Bavarian officers and soldiers. Image from author’s archive. 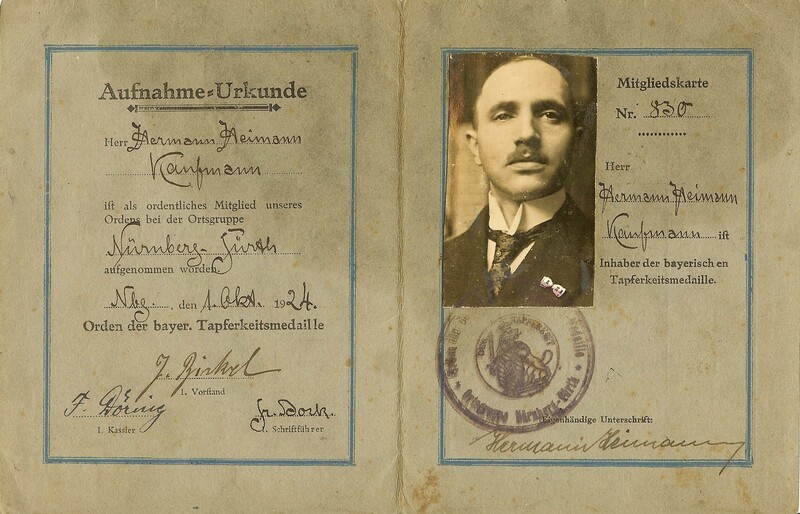 Figure 8: Entry for Hermann Heimann from “Haben die Juden in Bayern ein Heimatrecht?”. Image from author’s archive. At some point prior to 1942 Hermann Heimann left Germany and was scrutinized to see if he qualified for entry to Uruguay under their quota system. 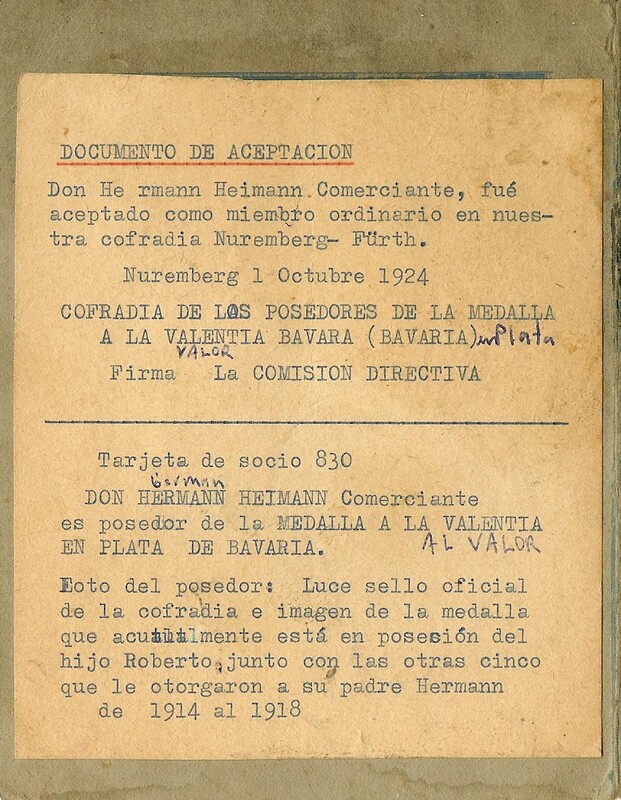 It appears as though his Orden der bayerischen Tapferkeitsmedaille membership book was provided to immigration authorities in Uruguay as proof of his valor during wartime in order to support his application for acceptance. Hence, one sees the type-writtern translation in Spanish pasted to the rear of this booklet. Also located in Montevideo, Uruguay, was this large photograph of Hermann Heimann and his four brothers. The photograph is a montage made up of individual images of Hermann and his brothers. The heading “Fünf Söhne von Herrn Julius und Frau Mina Heimann/ Inhaber der Firma H. L. Heimann, Nürnberg” translates as “Five sons of Mr. Julius and Mrs. Mina Heimann/ Members of the firm H. L. Heimann, Nürnberg”. The combined awards of the Heimann brothers and their various ranks are listed. In the photo, Hermann Heimann is wearing an Army Wound Badge (Verwundetenabzeichen für die Armee) in “silver” (mattweiß) for three or four wounds. The parents of the Heimann brothers were obviously very proud of their son’s military service and this photograph was probably displayed at one of their company offices. From left to right are: Albert Heimann, Leopold Heimann, Nathan Heimann, Hermann Heimann, and Max Heimann1. The textile firm H. L. Heimann was located at Celtisstraße 7, Nürnberg in 1930. The firm also had an office in Dresden and a store in Bopfingen, Württemberg. 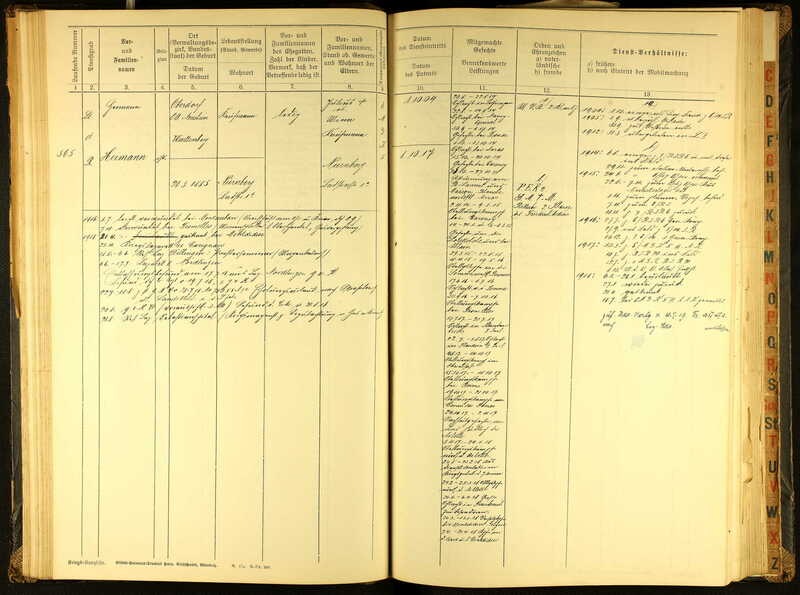 Julius and Mina Heimann were originally from Oberdorf, Württemberg and had at least ten children. The Leo Baeck Institute, Inc. has extensive documentation regarding the plight of the Heimann family2. According to their records, Albert, Leopold, Hermann, and their family members were successful in fleeing Germany and they relocated in Montevideo, Uruguay. Max, Nathan, and members of their families however were deported to Izbica, Poland3 in 1942. They did not survive their ordeal. 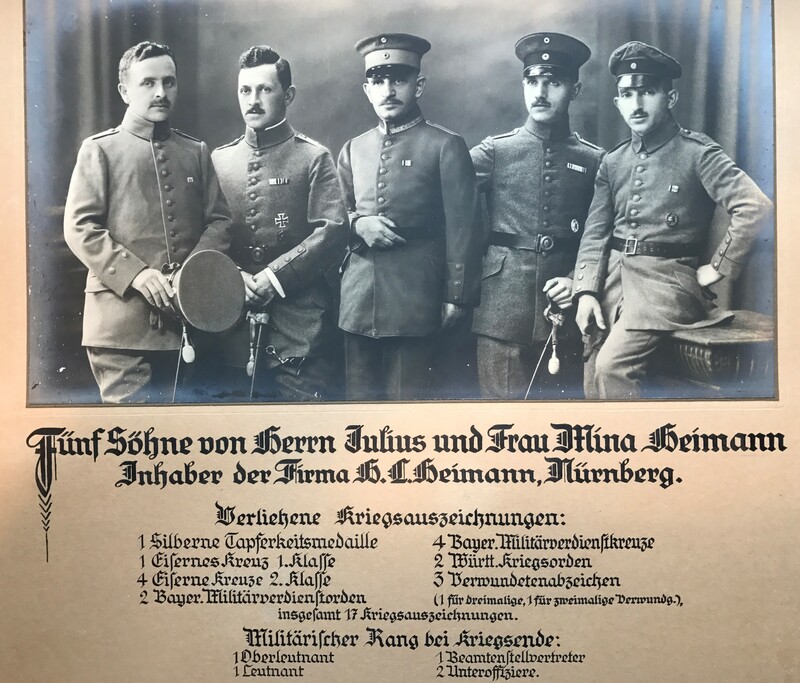 Figure 9: Photograph of Hermann Heimann and his four brothers. Image from author’s archive. 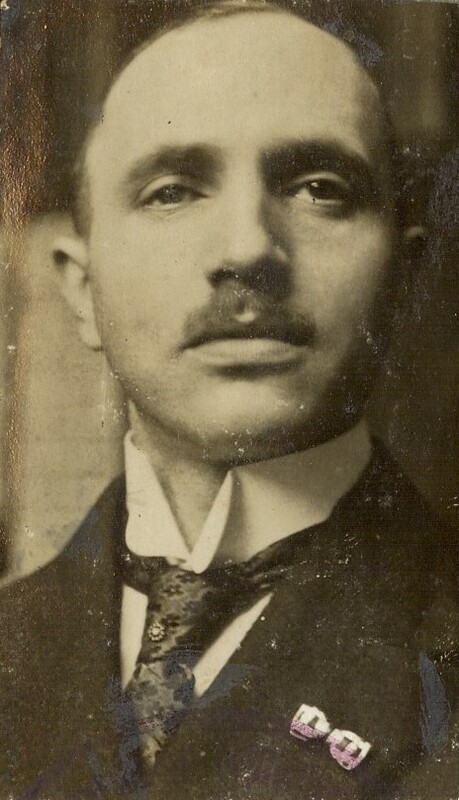 Figure 10: Detail of photograph showing Hermann Heimann. Image from author’s archive. Thank you for your interest regarding this article. Comments are welcome. Bearbeitet vom Bayerischen Kriegsarchiv. Bayerns Goldenes Ehrenbuch. Verlag Joseph Hyronimus, München, 1928. Eckstein-Bamberg, Dr. Adolf. Haben die Juden in Bayern ein Heimatrecht? Philo-Verlag GMBH, Berlin, 1928. You are showing a very interesting and well-prepared article about Heimann. Only the picture of the medal you should exchange. 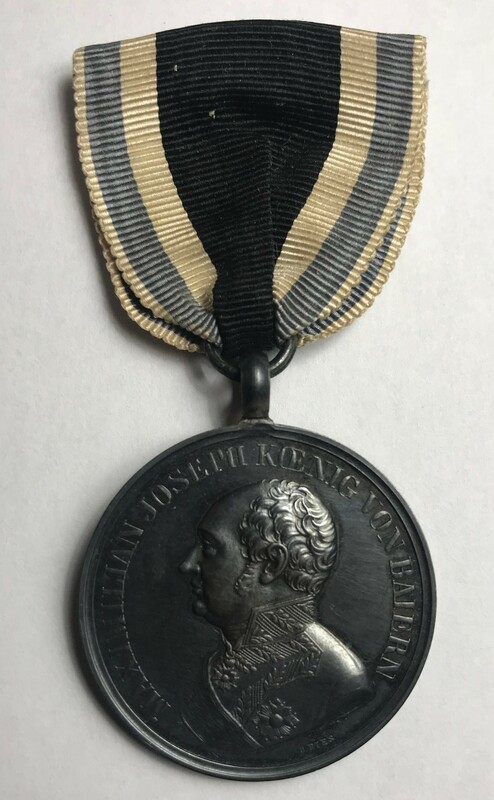 It shows a very late medal, which was marked with a new stamp. Recognizable by the outstretched tongue of the lion. I once asked a collector friend if he could send me more information about Heimann, which I would then hire here. Thank you for the information regarding the Silver MVM/TKM in the photo. I knew that this was a less-common die-variation, but I did not know that it was from late in the World War. I will change the photo in the near future. Thank you for all of the fantastic information regarding Hermann Heimann and the H.L. Heimann company. I know only sets with this variant, which were issued by the so-called “Abwicklungsamt” after the war. I have now added photos of an earlier coinage of the Silber MVM/TKM of the type that would have been awarded to Hermann Heimann. This coinage has the reverse die without the lion with his tongue extended. Please note that the H.L. Heimann firm is listed on Page 24 under “Manufakturwaren/Großhandlungen”. This is very interesting information. This page shows that he obtained the rank of Leutnant der Reserve. I also see a “M.V.K. 2 Kl m (Schwerter)”, “P.E.K.2.”, “S.M.V.M”, and “Ritterkr 2. Klasse der Friedrich Ordens” entries on this page. So, he was awarded the Bavarian Military Merit Cross 2nd Class with Swords, the Prussian Iron Cross 2nd Class, The Bavarian Silver Military Merit Medal (Bravery Medal), and the Württemberg Knight’s Cross 2nd Class of the Friedrichs Order. He therefore received a field-grade promotion to Reserve Lieutenant and was awarded the Friedrichs Order thereafter. And here there are more interesting entries! I see that he was in the hospital often at the end of the War. 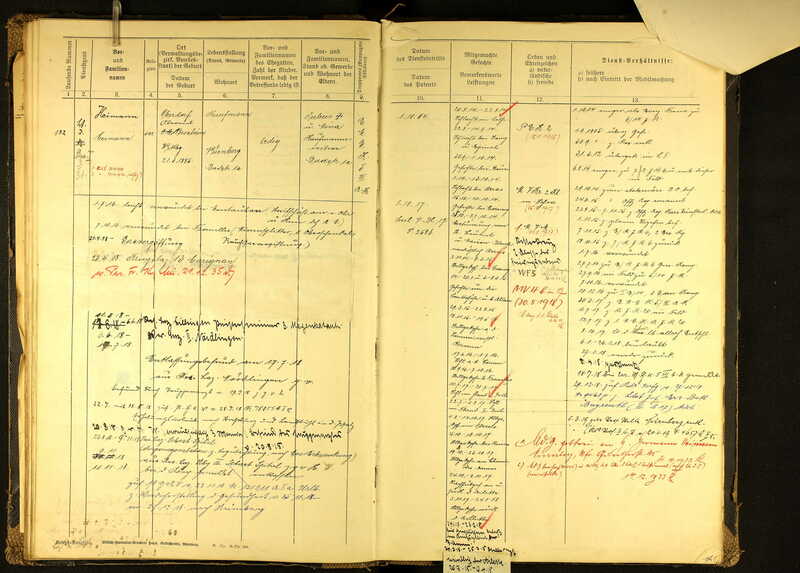 From August 22, 1918 until November 9, 1918 he was at a Reserve-Lazarett due to ailments that I cannot read and “Gas Erkrankung” (gas sickness). Here the date January 25, 1915 is associated with the Prussian Iron Cross 2nd Class. The date January 25, 1917 is associated with the Bavarian Military Merit Cross 2nd Class with Swords. Also, the date May 29, 1917 is associated with the Bavarian Silver Military Merit Medal (Bravery Medal). Their is also a listing for the Württemberg Knight’s Cross 2nd Class of the Friedrichs Order written as “Ritterkreuz 2. Klasse der Friedrichs Orden = WF5”. There is some writing and the date October 30, 1933 associated with this entry. Further there is a “MV4 b. m. Schw.” entry and an associated date of May 30, 1918, and a notation written on December 12, 1933. This was most likely a notation for the awarding of a Bavarian Military Merit Order 4th Class with Swords. There are also many listings of famous battle locations and unit assignments. Some of the entries are difficult for me to read however. 6.6. – 17.7.1918: Lazarett II Nördlingen, Entlassungsbefund am 17.7. April 23, 1918: Military Hospital 13 Carignan ??? 6.6. – 17.7.1918: Infirmary II Nördlingen, dismissal on 17.7. The silver medal for bravery he has earned after my documents (Bavaria’s golden book of honor) on 1.7.1916. Why in the root role the date is 25.10.1917, I do not know. I suspect that Heimann received the permit or the deed on this day and this was noted in the root role. Always interesting to follow the career of a Bavarian soldier. Thank you for listing all of this information. It is very interesting. I see that his wound badge (Verwundetenabzeichen für die Armee) is not listed here. They were issued late in the War, so the award process was possibly somewhat less formal and on a local (Unit) level only. The wounded badges were not always entered in the root roles after the war, even if he of course would have one. I have to mention that a very good collectors friend from Aschaffenburg has sent me the Stammrollenauszüge. Unfortunately, I do not have access to Ancestry. Thank you for the information regarding wound badges. My sincere thanks also to your friend from Aschaffenburg for providing the Stammrollenauszüge. 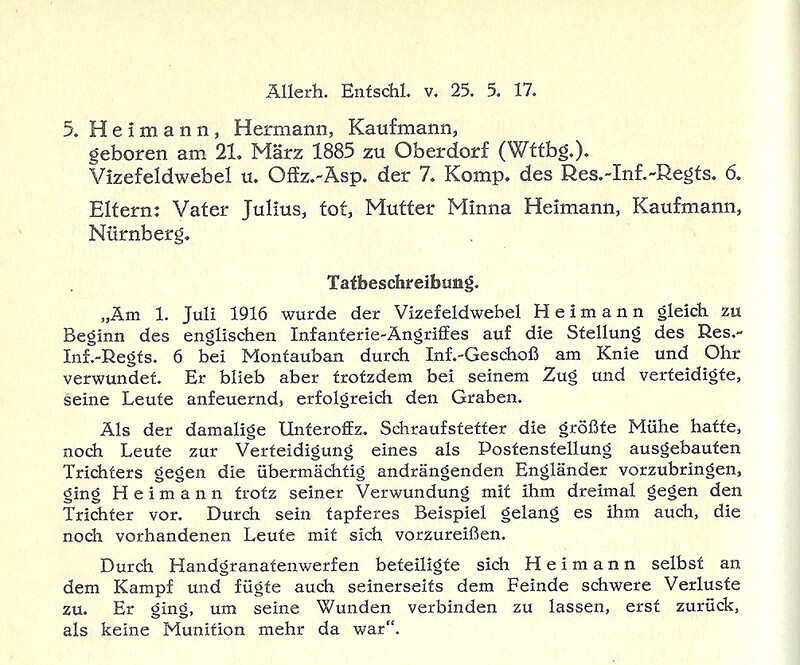 This information has provided the remainder of the story regarding Heimann’s military career.